While not one of the largest or most populated counties in the state, Queen Anne’s County is one of the most frequently visited areas in the entire Eastern Shore. It is also part of an area in Maryland that is experiencing an exponential growth in population. 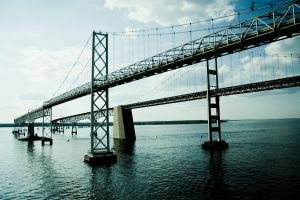 While the total number of permanent residents is around 50,000, this number will continue to increase as more people than ever are calling this area home, and are making the commute across the Bay Bridge to larger markets such as Annapolis, Baltimore, and even Washington. A decade ago there would only be traffic getting on and off the bridge during the summer weekends, but now cars line up on Route 50 in both directions during each workday at rush hour. Despite the fact that the population and tourism in the area has grown, the crime rate has actually decreased in the past few years. In the last 5 years the total crime rate has gone down by about 1.5 percent, while the property crime rate has gone down about 3.5 percent. The most noteworthy crime statistics are the nearly 25 percent decrease in burglary cases and the 7 percent decrease in auto thefts. Crime rate statistics released by the Governor’s Office do not include the most common statewide offenses of drug possession and DUI. Incidents of drug possession and sale are more common than property crimes, with marijuana making up the most CDS cases. DUI and other traffic citations are also quite common in Queen Anne’s County, especially in the summer months when road traffic on 50 and 301 is much higher due to the tourism season. The county itself has become a tourist destination, with towns such as Kent Narrows and Queenstown being popular waterfront attractions. The state and county police definitely issue their fair share of tickets, and conduct a large number of drunk driving investigations on out of state drivers as well as state residents. If you are arrested or cited for a criminal or traffic offense in Queen Anne’s your case will be heard in the District or Circuit Courts, which are both located in Centerville. The incorporated city of Centerville is the county seat or capital, and it has a permanent population of about 5,000 people. There are 7 other incorporated cities throughout the county. Most of these cities have their own police and fire departments, as opposed to non-incorporated cities such as Chester and Stevensville, which use the county for civil services. The county highways are patrolled by the sheriff’s department and the state police. The Herbst Firm has extensive experience defending criminal and traffic cases throughout the Maryland Eastern Shore. Our lawyers understand that cases are handled differently in the less populated areas of the state, and we have the knowledge and dedication to achieve the best possible outcome in your case. Whether you or a loved has been charged with a felony such as robbery or burglary, or a misdemeanor such as drug possession, we are standing by to assist in your defense. Benjamin Herbst is available 24 hours a day for a case consultation, and is willing to travel to meet you to discuss your legal situation.